I spent some idle time thinking about the topic lately, and I think that this can be a pretty good blog post. 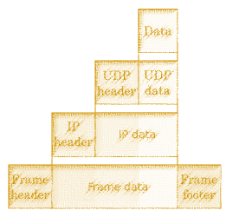 The goal is to have a generic application level network protocol for client/server and server/server communication. There are a lot of them out there, and this isn’t actually design work that I intend to implement. It is a thought exercise that run through a lot of the reasoning behind the design. There are network protocol that are specific for a purpose, and that is reflected in a lot of hidden assumptions they have. I’m trying to conceive a protocol that would be generic enough to be used for a wide variety of cases. Here are the key points in my thinking. By not re-inventing the wheel I mean that this should be relatively simple to implement. That pretty much limits us to TCP as the underlying mechanism. I’m actually going to specify a stream based communication protocol, instead, though. With the advent of QUIC, HTTP/3, etc, that might actually be useful. But the whole idea is that the underlying abstraction that we want to rely on is a connection between two nodes that is a stream. All the issue of packet ordering, retries, congestions, etc are to be handled at that level. At this day and age, security is no an optional requirement, and that should be incorporated into the design of the system from the get go. I absolutely adore TLS, and it solves a whole bunch of problems for us at the same time. It give us a secure channel, it handles authentication on both ends and is is both widely understood and commonly used. This means that selecting TLS as the security mechanism, we aren’t limiting any clients. So the raw protocol we rely on is TLS/TCP, with authentication done using client certificates. By far the most common usage for a network protocol is the request/reply model. You can see it in HTTP, SMTP, POP3 and most other network protocol. There is a problem with this model, though. A simply request/reply protocol is going to cause scalability and management issues for the users. What do I mean by that? Look at HTTP as a great example. It is a simple request/reply protocol, and that fact has caused a lot of complexity for users. If you want to send several requests in parallel, you need multiple connections, and head of line queue is a real problem. This impact both client and servers and can cause a great deal of hardship for all. Indeed, this is why HTTP/2 allows framing and to send multiple requests without specifying the order in which the server reply to them. A better model would be to break that kind of dependency, and I’m likely going to be modeling at least some of that on the design of HTTP/2. This will give you what is effectively a shell into the server, and you should be able to write commands there and get their results. I used to play around a lot with network protocols and being able to telnet to a server and manually play with the commands is an amazing experience. As a side affect of this, it also means that having a trace of the communication between client and server will be amazingly useful for diagnostics down the line. For that matter, for certain industries, being able to capture the communication trace might be an absolute requirement for auditing purposes (who did what and when). What we are left with, though, is what is the actual data on the wire going to look like? Where token is either a sequence of characters without whitespace or a quoted string if it contains whitespace. Following the command line, you have the headers, which pretty much follow the design of HTTP headers. They are used to pass additional information, such as the timeout for that particular command, command specific data (like the Include header on the first command) or protocol details (like specifying a timeout for that particular command or that the second command has a body and how to read it). A command ends with an empty line, and then you have an optional body. The headers here serve a very important role. As you can see, they are key for protocol flexibility and enabling versioning. It give us a good way to add additional data after the first deployment without breaking everything. Because we want to support people typing this manually, we’ll probably need to have some way to specify message bodies that a human can type on their own without having to compute sizes upfront. This is something that will likely be needed only for human input, so we can probably define a terminating token that would work, not focusing on this because it isn’t a mainline feature, but I wanted to mention this because debuggability isn’t a secondary concern. You might have noticed a repeated header in the commands I sent. The Sequence header. This one is optional (when human write it) but will be very useful for tracing, so tools will always add it. A stream connection is actually composed of two channels, the read and the write. On the read side of this protocol, we read a full command from the network, hand it off to something else to process it and go right back to reading from the network. This design is suitable for the event based systems that has proven to be so useful to scale the amount of work a server can handle. Because we can start reading the next command while we process the current ones, we greatly reduce the number of connections we require and enable a lot more parallel work. Once a message has been processed, the reply is sent back to the client. Note that there is no requirement that the replies will be sent in the same order as the requests that initiated them. That means that an expensive operation on the server side isn’t going to block cheaper operations that came after it, which is again, important for the overall speed of the system. It also lends itself quite nicely for an event loop based processing. The sequence number for the request is used in the reply to ensure that the client can properly correlate the reply to the relevant request. On the client side, you write a command to the network. When reading from the network, you need to keep track of the sequence number you sent and route it back to the right caller. The idea here is that on the client side, you may have a single connection that is shared among several threads, reducing the number of overall connections you need and getting better overall utilization from the network. A nice property of this design is that you don’t have to do things this way. If you don’t want to support concurrent requests / replies, just have a single connection and wait to read the reply from the server whenever you make a request. That give you the option of simple stateful approach, but also an easy upgrade path down the line if / when you need it. The fact that the mental model of the user is request/reply is a great help, to be honest, even if this isn’t what is actually going on. This greatly reduce the amount of complexity that a user need to keep in their head. Some details on the protocol would need gentle massaging, to ensure that a human on the command line can type reasonable commands, but that is fairly straightforward. The text based nature of the communication also lends itself nicely to tracing / audits. At the client or server levels, we can write <connection-id>.trace file that will have all the reads and writes on that connection. During debugging, you can just tail <connection-id> the right file and see exactly what is going on, or just zip them for achieve for auditing. This command on the connection can do things like change how we encode the data, in this case, ask the server to use gzip for all reads and writes from now on. The server can reply with a message (uncompressed) that it is now switching compression and everything from that point forward will be compressed. Note that unlike HTTP compression, we can get the benefits of compression across multiple requests, and given that most requests / reply have a lot of the same structure, likely benefit quite us by a lot. The last topic I listed is the notion of push operations and how they should be handled. Given that we don’t have a strict request/reply model, there is an obvious way for the server to send additional data “out of band”. A client can request to be notified by the server of certain things, and the server will make a note on that and just send the data back at some later time. There is obviously the need to correlate the push notification to the original request, but that is why we have the headers for. A simple CorrelationId header on the original request and the push notification will be sufficient for the client side to be able to route that to the right callback. I think that this is pretty much it, this should cover enough to give you a clear idea about what is required and I believe that it is enough for a thought exercise. There are a lot of other details that should probably be answered, for example, how do you deal with very large responses (break them to multiple messages, I would assume, to avoid holding up the connection for other requests), but that should be the gist of it. many years ago i was tasked with designing a communication protocol for an industrial motion controller. Something new for me at that time, i had no experience and no knowledge of existing solutions - and this ignorance led to something interesting. Earlier project was to write the motion controller software itself, which i also had no idea how should be done - so i wrote some c libraries and created a mini distribution of Linux (barebones, about 10-12 megabytes), and used TCL for writing simple control scripts. TCL is a nice language, and has this lisp-y property that the program and data are just same thing - a data structure. And then had this idea - what if we use the TCL interpreter as a Linux shell? And voila - we have a communication protocol - just SSH to the control board and write your commands on the console. Debugging, security, serialization format -all in place, it was really pleasant to use, even if the product never really took off. Will, I read through that document yesterday, and it is interesting. One thing it doesn't do, however, is allow to reorder requests, which is very important for the type of interactions that I'm thinking about. Isn't this pretty much exactly what http2 was designed to do? Although it's syntax is obviously optimized for urls, the similarities between what you describe and http2 are many.